devoted to anything related to vintage color TV. From Tidbits II, it's possible to search the entire site using key words, and you can use Boolean operators. For example, type "Model 5 and Bloomington" and get two hits. Type "model 5 or bloomington" and get about eight hits. Click on Help if you need more information. Who says we don't dream in color…? Elsewhere on this site I've mentioned that WFIL channel 6, the ABC outlet in Philadelphia, scooped the NBC outlet, WPTZ channel 3, by being first with live local color programming. WFIL-TV had a single RCA TK-41 color camera. It got quite a workout, what with local news and weather in color every day, plus kid's shows like Chief Halftown and Sally Starr. More than once it was on Broad Street near Philadelphia's city hall on a bitter-cold New Year's day broadcasting the Mummer's parade live. 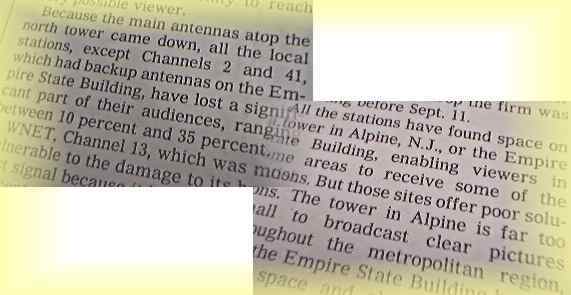 I saw the TK-41 and WFIL-TV's TK-26 film chain once in 1959 at their downtown studio. One of my fellow students interned at WFIL-TV and operated the TK-41 often that year. What I just recently learned was that Philadelphia's CBS outlet, WCAU channel 10, had two TK-41 color cameras. A newspaper, the Philadelphia Evening Bulletin, owned WCAU-TV until the summer of 1958. Then CBS took over and promptly dropped local color and kept the station monochrome for the next eight years or so. But occasionally, the first CBS network show of a new season would be in NTSC color. I watched those shows over WCAU-TV on my RCA CTC-10, then by 1963, on my CT-100. I particularly remember "Lassie" and "Dr. Kildare" in color for one show only. But, to listen to the network hype, a monochrome TV owner would think the entire series was in color. It's a hot mid-August day in 1954. Frank Stanton, head of CBS, complains vociferously that the Senate's ban on televising the McCarthy hearing is unfair. New Jersey's first school of medicine and dentistry opens at Seaton Hall University's Jersey City Medical Center. A new 10-trip ticket goes into effect on The New Haven and Hartford Railroad -- fairs from Darien, Conn. to New York City are $1.10 one way. It is the middle of February 1955.
in the Empire State Building. Joe Marotta is tending the video and aural transmitters at the flagship CBS television station, WCBS-TV channel 2, in New York City. A throaty rumble trumpets from dual glasspacks. 292 cubic inches of Ford V-8 muscle nudges your Victoria ragtop efffortlessly, smoothly, down West Alameda. Shed some light on the "19-in." 15GP22? without an answer for more than 42 years. In 1959 when I was 12, I would take a bus about four miles to the Egyptian Theater for a Saturday afternoon matinee. There was an old radio and TV repair shop along the way. Its shop area was right up front -- you could look in the window and see what was going on. To this day, I have not forgotten what I saw on the repair bench. It sat there for several years. It was a two-piece TV chassis, there was no cabinet, the chassis appeared to be copper plated, and its CRT was very strange looking. One day when I was really curious, I went in to ask what it was. The technician said it was a color TV, but it didn't work. The thing that haunted me the most over the years was the picture tube. Clearly, it was a very early model, even experimental in nature. The actual viewing screen appeared to be a flat glass phosphor plate mounted behind the front faceplate of the tube. For more than 42 years, the image of that strange color TV chassis and weird-looking CRT stayed in the back of my mind. 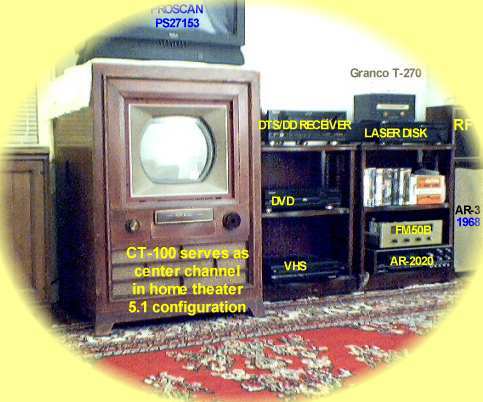 Thanks to your site I now know that it was the same CRT that is in your RCA CT-100. And thanks to your page about the 15GP22, I have solved the riddle of that weird CRT with the flat piece of phosphor-coated glass inside it. I have since found someone else's site through your links with photos of what I believe was in the window the repair shop. 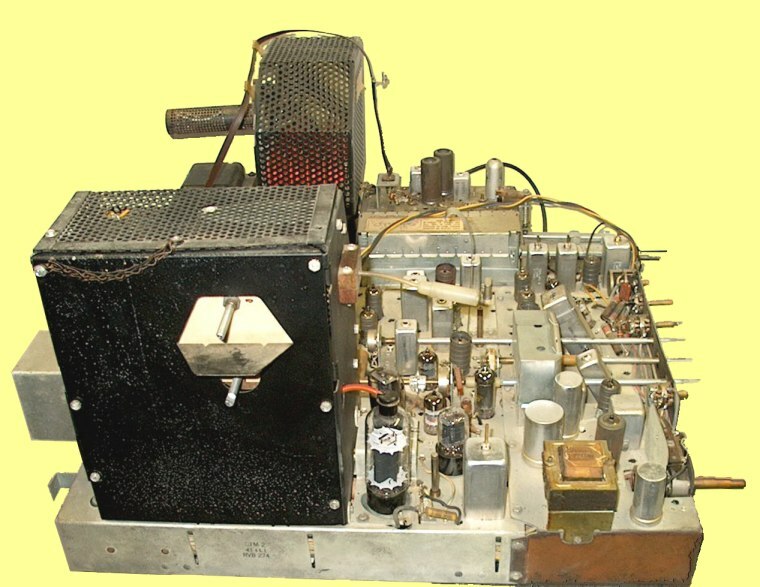 Although Bruce has a photo of a two-chassis Admiral that appears to be copper plated, the photo which Rob has posted of his prototype Westinghouse is by far a better match due to the physical mounting of the CRT directly on the chassis itself. I wonder if Rob's set uses a separate power supply chassis? If it does then we have a match . Hope you will have good luck rebuilding the CRT for your set. I would love to see one of these pieces of history some day. Important technological breakthroughs that have changed the whole world as we know it, must be preserved for posterity. 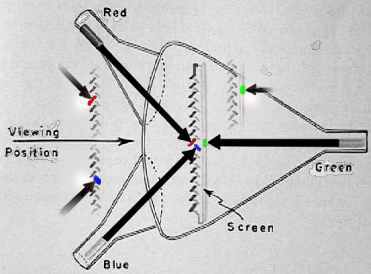 The 15GP22 tricolor picture tube and its progenitor, the developmental C-73599, were the first of only a few color picture tubes to use a large round flange to get ultor voltage inside the tube. This flange isolated the glass faceplate from the glass funnel, and thus it created a huge metal-to-glass seal with concomitant vacuum integrity issues. Click here for more . TV Tidbits from the Distant Past I was born and raised in central Indiana. In my youth, I worked for a Zenith dealership where I met old timers who told me tales of radio and television from its early days. Some of them had worked on the RCA assembly line in Bloomington, Indiana. One old-timer told me that in 1928, he was working on a radio assembly line when all of a sudden, the cabinets started showing up with a hole in them. When he went to ask what the holes were for, he was told they were for television. This is a summer 2001 photo. I have been frequenting your site for about a year now; however, I felt some envy at reading the exploits of the guys who have a Merrill in their collections. Am elated to report that as of Saturday, August 4th, I have joined the ranks of CT-100 owners! I was fortunate enough to acquire a CT-100 from a party in the Los Angeles area. The set is in overall good condition cosmetically with a few problems that need resolving such as removal of various nicks and a few deep scratches, some repair work to the veneer at the corners of the top lid, and a needed repair to one of the horizontal bars over the speaker grill, but thank God is still present and hanging on. Am hoping to have it cleaned up and polished in a month or so. At this point, the set's operational condition is unknown. I did make a rudimentary check of the CRT by placing my VOM across the filament pins and I did get continuity, which is a good sign, but of course guarantees nothing. Perhaps at a later date I can investigate the chassis more thoroughly. It is coated in a fine layer of dust, which tells me that at least it has not been molested in recent history. A broadcast engineer owned these set at one time, but apart from that I have very little knowledge of its prior history. Will do some asking and see if I can do some further investigating into its past. 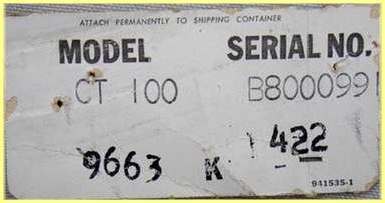 The number stamped into the rear of the cabinet and lid is 386. I am seeking a channel number indicator dial for this set which is the only part that is missing. Will continue to keep up on the 15GP22-rebuild news. If eventually I get this set operational, it will be good to know it can be rebuilt. I still have this great 21-CT-55 I acquired from Jeff a few years ago. ...to describe this attempt to develop a tricolor CRT. Just try to conjure up the cabinet. Here's a quote from the 50-year-old text this (slightly Pete-enhanced) image came from, "The third color [green], produced on the back of the screen, shows through the transparent supporting material and mixes with the other two color bands produced on the sides of the ridges. The ridges actually are very narrow and closely spaced." Whose design is this? None other than England's John L. Baird. Thanks again to Rick Plummer for contributing this bit of has-been history. Talk about convergence, this thing needs keystone correction! 1. A disk attached to the mandrel of a lathe to hold the work to be turned. 2. The glass front of a cathode-ray tube upon which the image is displayed. 3. A protective plate covering the human face, as of a welder or diver. Just heard this story from a servicer out of San Diego (no connection to our previous San Diego item). It seems his brother and he were checking a NIB 15GP22 they had owned for years. When the brothers removed it from its original RCA carton, they got a kiss-off greeting more than one of us has experienced -- white, powdery getter flashes. It was the kiss of death for a 15G when this happened twenty years ago. So the brothers did what I would have done in that situation. They took it apart. The faceplate was removed from the funnel to access the interior, but it turned out to be much easier than expected. Part of the faceplate around the ultor flange had separated. The metal-to-glass seal had, in effect -- although the 15G had always been stored in its original carton -- self-destructed. Depressing. But there can always be a bright side, and this is no exception. Here's an update on the condition of old but nimble LB 8727. This information was received from Walt on September 6. I did check the emision on the tube with a B&K 470 checker. The blue and red guns came up to normal emision in about 2 minutes, the green took 12 minutes. That was on Sunday. Tonight, Wednesday, the blue and red were the same, the green took 9 minutes. I will leave the checker on it for one hour, then check again Thursday night. And Walt's followup September 10. Hi Pete, The green gun came to full emision in just 3 minutes today, 9-10. I belive this tube wiil work as well as it did the last time I saw a picture on it some 30 years ago. Walt. Check it out -- click here! past and present Here's a variation on a theme pictured in Tidbits I. Floating above the same Zenith NTSC-TV PC board seen in Tidbits I is the cable-ready all-channel no-moving-parts solid-state varactor tuner. How large is the tuner? When I photographed the board in April 2000, I placed the RF amplifier tube from my CT-100 beside the diminutive tuner. There's a down-arrow pointing to the 6BQ7A 9-pin miniature dual-triode standing there in the lower left. What a difference half a century makes! My CT-100 fell into my hands in the early 1970's. I was picking up a telephone answering machine from a repair guy when I saw the set in his back room. He was moving and didn't want it. It had been in his family since it was new. Since I drove a Studebaker Wagonair, I was able to take it on the spot. Once home, I called RCA to inquire about service. They gleefully reported they had thrown out everything and had a party when they trashed the jig used for service. This CT-100 came from Bloomington, but it was never built there. It is genuine RCA Merrill to the core, but it didn't exist until the 21st century. and returning VHF television transmitters. The orange and white box on the shelf holds its never-sold NIB Granco T-300. The Hazeltine thread… Here's an original, 15GP22-based color video product. that its solid-state successors thrive to this day. In the fifties, the Hazeltine Company on Long Island, New York developed a system for viewing motion picture negatives as a positive on a tricolor screen. A five-inch broad-spectrum monochrome CRT illuminated the film. The image was collected by photomultipliers behind a dichoric beam splitter, and special amplifiers shaped the video signal, so the image on the display CRT was like looking at a film on a screen in a theater. I make color film analyzers and had the old stock from Hazeltine when they discontinued production. Film-analyzer equipment is still very much in use around the world -- in film labs making color corrections from student films up to the biggest pictures from Hollywood. There is credit at the end of a film for the color timer. He or she actually determines the final exposure of the finished picture using a color film analyzer. Hazeltine still exists, but sold the film analyzer business to a Hollywood company in 1985. The machines today are the size of a desk and use a Panasonic CRT, but up through the late seventies, RCA tubes were used. The earliest analyzers are now all gone -- the last survivor was an all-tube design from the late fifties that ultimately used a 21FJP22. It was in India, still running in 1995. About five years ago, a Mexican company traded in a tube analyzer that was totally inoperable, but it had the very first display, the 15-inch RCA tube. The user told me it last worked about 1975. Components had been removed over the years to fix other, newer machines. These were mostly film transport parts. I am fascinated by the early development of Color TV. In my 20's, I worked for the RCA Service company; they still had a CTC-9 in their training facility in Long Island, NY. I had two instructors, W. Ted Excelide and Ernie Holob, who were trained by Sarnoff's original engineering team on the CTC-1 (never produced). I didn't realize at the time the real significance of their work (they were in their 60's by this time, around 1980), but I was interested enough to ask a lot of questions about the development. They were kind enough to share their experience with a kid who was not yet born when they did their most significant work. Ernie explained that one of the problems with the CTC-1 was maintaining purity. The shadow mask had not been perfected at this time, and the vertical scan induced by the yoke would cause the mask to vibrate. One of the engineers was experimenting by changing the bias on the vertical output tube. As a joke, another engineer hid behind a wall (behind the set, out of the view of the engineer working on the vertical circuit). Every time the engineer working on the set made a change in the vertical circuit, the joker behind the wall would energize a de-gaussing coil, causing the set to go nuts. This went on for awhile until the culprit was exposed. I think Ernie was the straight man in this situation. The industry breakaway from RCA tricolor shadow-mask tubes came from Bing Crosby and Paramount. They developed a single-electron-gun CRT for sale to consumers that worked around the patents. Paramount found a small tape-recorder company in Japan to develop the patent. Trinitron was the name given to the tube, and Sony was the manufacturer. [Old editors simply CANNOT not edit. I own (not in my possession though) a 1954 Motorola 19 inch color; I had a new color tube manufactured for it in 1988. The rebuilder was not willing to rebuild the metal picture tube. It is currently at a repair shop, which went out of business. It worth trying to get it back? His assistant told me it is still in storage. I believe that it is actually in very good shape. It was a promo set at the start of color, then sat in a radio shop here in Omaha till 1988. > Is it worth trying to get it back? > 19-in. CRT and was not converted to 21-inches. > manufacturing process? Was it reasonable in cost? for this great shot of his chassis. Unedited Email [Old editors simply CANNOT not edit. I hope all is well with you in the New Year. I read with interest in Tibbits II about the recovery of the 19" Motorola color set. The 19" color sets produced in late 1954 bridged the gap between the overpriced small screen sets and the more consumer acceptable 21 inchers. 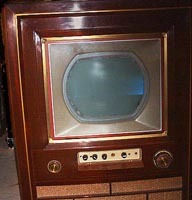 The 19" sets were mainly produced by Motorola and CBS Columbia using the CBS 19VP22 picture tube. Several other makers also produced 19" versions in very small quantities. I do own a very rare Capehart 19" color set which uses that same tube. I have never seen or heard of another one. The model # is CXC12. I also have the factory set up and owner's instructions. The cabinet is typical of upright consoles not unlike the CT-100. The top is removable. The set has a 40-tube single chassis plus pix tube. It is currently stored at the UCLA TV archives. The Capehart was produced by the Capehart-Farnsworth Co. of Fort Wayne, Indiana. Here I tried, really tried, but just couldn't keep my hands off -- I've just tweaked the hue control on the museum's operational CT-100. You will hear much more from and about this museum in the coming years... --Pete, 20 January 2002.
and enjoy the glow of the firebottles! Cheers. From... Whatever became of Bloomington…? newly discovered CT-100s added to the Living CT-100 list -- both Merrills are in California. 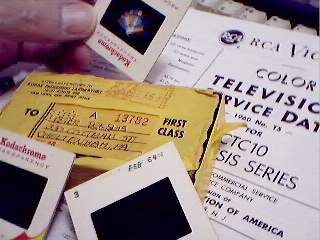 surrounding the original contents of the now-lost shipping carton. "My CT-100 was originally sold in Los Angeles and remained in the original owner's home until 1976 when that person's house was slated for demolition due to a freeway project in that neighborhood. It was rescued by a noted collector of the area, a gent named Gary Hough who sadly died several years ago. The set then ended up in a horse stable storage room in Orange County south of Los Angeles, and it is from there that I acquired the set. It was complete and in surprisingly good condition with a good 15GP22. The cabinet has since been refinished. --Eric S." An hour or so after posting this notice, received this email from Steve Dichter in California: "I knew Gary for several years before his far too early death. His small home was jammed to the rafters with early TV's and other TV related materials. He is the one who located my CTC-5 "Wingate" model and bravely helped me lug it up two flights of stairs many years ago. It still sits proudly in a corner of my living room. I understand that following Gary's death and before things could be removed, a fire completely destroyed his home. Many early television sets and items were destroyed. I remember seeing many early color sets there including a huge Hoffman "Colorcaster" model. Gary was a very shy and reclusive person. His whole life centered around his collection and I was flattered he let me in for a brief while." collection was acquired by collectors before his passing, including the Hoffman Colorcaster. The bid went to the next level by the next morning -- Pete. In 1968 I inherited a CTC-5H built in 1957. All it needed was a new focus pot and a couple of caps. I got a great picture on it, but the tint control was way out of range. Without a schematic, I traced the circuit thru the tint pot, to a cap, and (the burst amp?). The tube was a 6CB6 as I recall, so I figured that a 6AU6 would have more interelectrode capacitance, and center the control. I used to turn off all the lights, and when Star Trek came on (the Original series, first-run episodes), I had the brightness set so that in the beginning sequence, outer space was totally black, with only the stars shining. When the Enterprise flew by, the effect was startling. A far cry from today's TV which give us washed-out images on plastic boxes with tinny, resonant speakers. It ran fine, until I went in the army for a few years. It still worked, but not as well, and I needed the room. Hopefully it's still in someone's house. I was surfing the web today and came across many sites on early color tv including yours. I don't know if you are trying to track the CT-100s still in existence but if so, I have one! I got it about 25 years ago when I was in high school. I paid $30 for it. It was complete but the cabinet had some scratches as it sat in the electronics lab at school. It took me a few years but I did get it working. In the late 70s and early 80s I was a repairman in a local TV store. And now had the means to get it to work. I remember thinking at the time that it had that typical RCA color to it (I was always a Zenith person). Anyway, as with most old tvs (I have about 20 or so) if you don't plat them every so often they don't stay working and that is the case for my CT-100. Some day I'll get back to it. As I was looking at your web site I saw the reference to the 2 inch suitcase tv that you built. This is interesting because I have always been interested in television and I bought that magazine back in '75 and I still have it. I was 14 then and read that article [click here] many times and had dreams of building one myself. I started to from time to time but never did get a finished set. I guess I still haven't given up as I bought a 2AP1 tube from ebay not too long ago. Here's an interesting logo from CT-100 owner Dave Abramson. He writes: The color logo is one I fixed up in Photoshop. It's a mid-50's camera-mounted side logo from original B&W art. I added color based upon a sample of the proper color in the same logo that NBC used. Just for fun this morning, I typed in "Hoffman Colorcaster" into Google (I really should be sleeping right now, but...) and wound up on your webpage. I was sorry to hear about the guy who had one who died, but was glad to know that someone had gotten his TV. When I was a kid, we had one of these sets. My father purchased it new in 1955 (actually he got it wholesale... he was a Hoffman dealer -- Yowell's TV Radio Service, La Crescenta, CA). 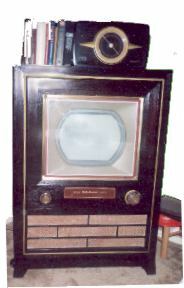 It was one of only two color TVs he sold during the time he had his TV shop (1951-1961). It was a 21" model, seemed gigantic to me (I was born about the time my dad got the set), and the cabinet had that '50s style blond finish. It stopped working in 1961, victim of a failed flyback transformer. By this time, Hoffman had left the consumer electronics field, my father closed down his TV shop, and, at over $50.00 for a replacement, he just felt it was too expensive to repair this set. So it sat in our living room until 1966, acting as a stand for an RCA portable until replaced by a 23" Admiral, one of the early rectangular screen color sets. It was then relegated to the junk room for a couple years, until we sold the house to the state of California, to be demolished to make way for the I-210 freeway. (If you get off that freeway using the Ocean View offramp, you drive right over the site of our old house.) That set was left behind with a 1946 vintage DuMont, probably several other now-interesting sets, and a 1957 Goliath microbus (when was the last time you saw one of THOSE?). All of these, I presume, were flattened by big yellow Caterpillar tractors and hauled off to the dump. These were things I would have liked to have saved, but to my folks they were all just old junk (kinda like a '286 computer), and who listens to a 12 year old kid anyway?